We all know that serial killers are despicable, but you’ve got to admit that a select few of them do have some redeeming qualities. Here are the only five serial killers who we are willing to endorse. Look, it’s not a good idea to go around defending serial killers all willy-nilly, but David Berkowitz (a.k.a. “Son of Sam” or “Mr. Monster”) wasn’t just any serial killer. Yes, he murdered six people and seriously injured seven others, but he ALSO sent letters to the NYPD telling them to expect several more murders from him in the upcoming weeks. So while we can’t deny Berkowitz was a bloodthirsty maniac with some serious mental problems, we’d be hard-pressed to trash someone who was considerate enough to warn the police about what he was going to do. If you could just take a second and look past all the murder, abduction, and “human hunting” that notorious Alaskan serial killer Robert Hansen did, you’d see that he really did have some good stuff going on under the surface. First of all, the people he was murdering were prostitutes and strippers that he hired, so if you think about it, he was supporting local small businesses. And second, it was the ’70s—who didn’t do something they regretted during those years? Again, it’s not like we’re vouching for every single serial killer, but out of all the terrible serial killers in the world, these ones are the most defensible. Be honest. Can you really say you know a way to collect slaves for the afterlife that doesn’t involve murder? Sure, if there were a less grisly way to create an eternal army of servants, we’re sure the Zodiac Killer would have done it, but when it comes to achieving eternal paradise after death, we all know it doesn’t make sense to take any chances. Plus, along the way, he left us with some objectively incredible puzzles—three out of four of which have yet to be solved. At the end of the day, do we love the Zodiac Killer? No! But would we defend him? One hundred percent. Aileen, yaaas! You go, girl! 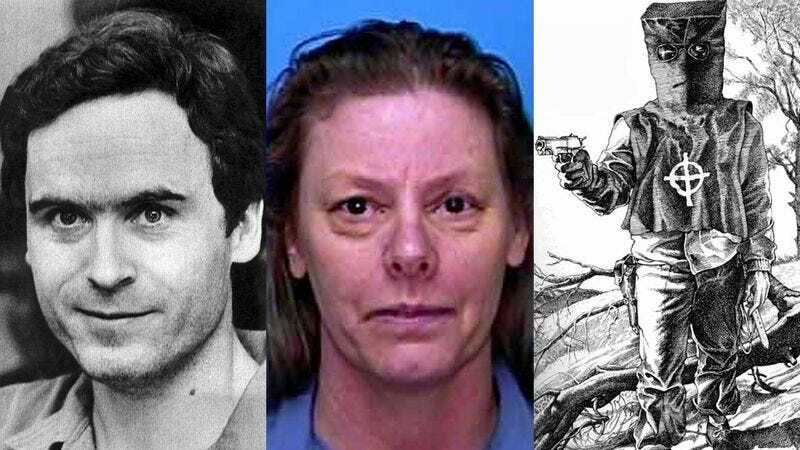 Florida serial killer Aileen Wuornos killed seven men at point-blank range before being arrested, making her a better serial killer than many of her male counterparts. Sure, that doesn’t exactly look good when you’re on trial for manslaughter, but from a female perspective, that’s some serious girl power, especially considering she did all that way back in the early ’90s. Okay, that’s it. No more. As far as we’re concerned, there’s just one more serial killer worth defending and his name is Ted Bundy. Born to a single mother and raised by an abusive grandfather, the man clearly went through a lot at an early age. So, really, in a way, it’s a testament to his strong will that he didn’t end up killing more than the mere 30 people he murdered in the ’70s. The fact that he didn’t become a full-blown terrorist or something even worse is VERY impressive. Just think what he could have done if he gave into ALL his impulses? Ted, we know you’re dead, but we’ve got your back. Same goes for everyone else on this list.